Labor Economics provides a modern introduction to labor economics, emphasizing both theory and empirical evidence. 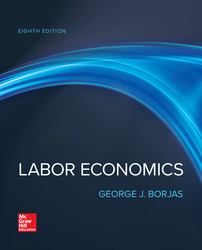 Borjas uses examples drawn from state-of-the-art studies in labor economics literature and introduces methodological techniques commonly used to empirically test various aspects of the theory. Labor Economics is thoroughly integrated with the adaptive digital tools available in McGraw-Hill’s Connect, proven to increase student engagement and success in the course.